#rimbit #scam @rimbitwhale WARNING. Read this link and SHARE!!! As you all know Rimbit is a SCAM coin. A guy who claims to be called Tom Conley is posting on Twitter under the account @rimbitwhale. He has contacted more of you guys. He has also contacted me and multiple times being very aggressive and threatening in his communication. He also claims to be very wealthy and have "unlimited" funds. He claims to have invested a lot in Rimbit. Of course I like you knew what he is trying to do so I played along, but told him to stop threatening or I would file a case with the Police. What he wants of me is to close this forum. To stop the negativity around Rimbit. To test him I made an offer of 4 BTC all in all to remove the negativity here, on bitcointalk, on Twitter etc. I also told him that morally it would be okay to support Rimbit again if Mark was out and if Rimbit was to be used for something good. He answered that he would have funds coming in next week...meaning a week ago. I never heard anything back. I saw Mark Karlson @rimbit (Twitter) was posting that the explorer is up. That tells me that Mark is still in!! 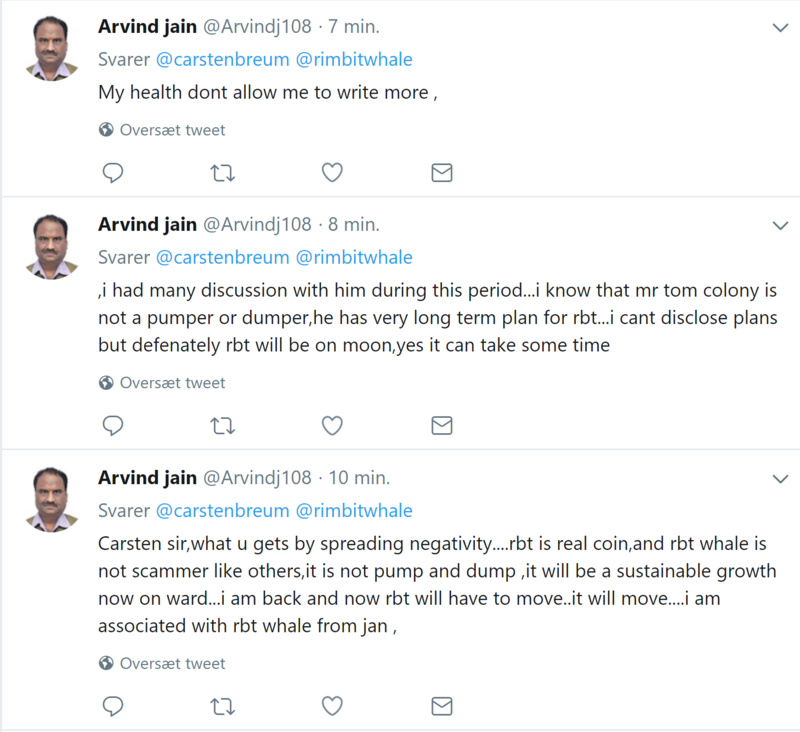 Today I started replying on Twitter to @rimbitwhale that it was a scam and a pump and dump. We won't accept threats! We promised to continue warn people against the Rimbit scam so let's share a WARNING about rimbit on social medias. So Tom and Mark are one and the same? That would make sense as I cannot see anyone else being interested in bringing Rimbit back from the dead. (2018-06-11, 12:06 PM)BobBobert Wrote: So Tom and Mark are one and the same? That would make sense as I cannot see anyone else being interested in bringing Rimbit back from the dead. I don't know Bob. Maybe Tom is one of Marks many personalities. It are 2 different people. Mark is not able to write correctly. Tom's writing style is completely different and without spelling faults. Believe me they are not one. Is this guy Arvind for real?? 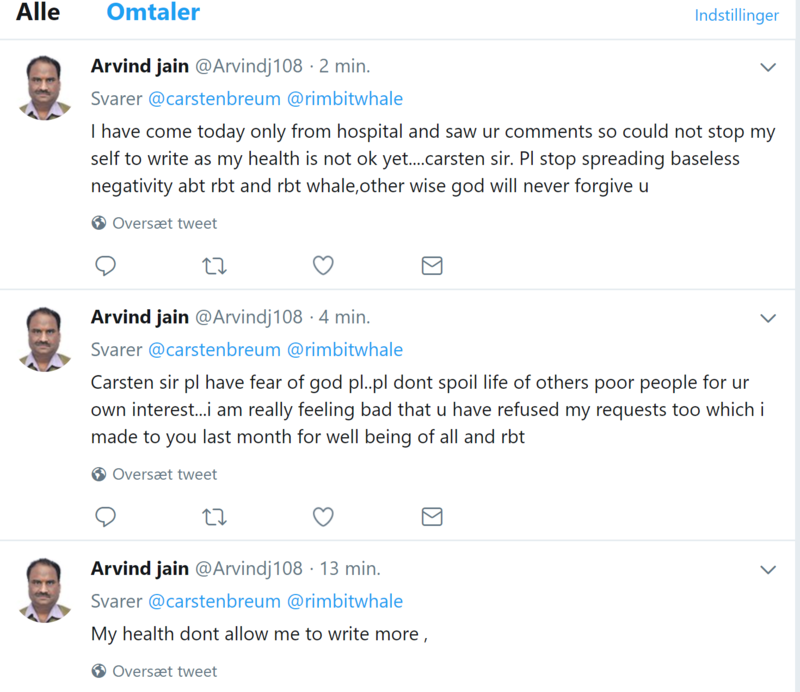 (2018-06-11, 04:27 PM)Carsten Wrote: Is this guy Arvind for real?? It looks like a soap. The guy should write books instead of investing in RBT. He could make a fortune. I was thinking since a lot of Pakistani and probably Indian people give likes to the Rimbit.dk Facebook page this guy is real. On the other hand if he has invested all his money in Rimbit then he is about to be a very poor man. I never tweeted about Rimbit before. Today I did. (2018-06-11, 04:58 PM)Hugues Wrote: I never tweeted about Rimbit before. Today I did. I hope that if he is real he has not invested too much into rimbit. I think he sounds like many of us did before we found out the truth. Current time: 2019-04-19, 10:44 PM Powered By MyBB, © 2002-2019 MyBB Group.